Experience the true story from American history about the spiritual roots and historical beginnings of Thanksgiving. This entertaining and historical story shows that the actual hero of Thanksgiving was neither white nor Indian but God. In 1608, English traders came to Massachusetts and captured a twelve-year-old Indian, Squanto, and sold him into slavery. He was raised by Christians and taught faith in God. Ten years later he was sent home to America. Upon arrival, he learned an epidemic had wiped out his entire village. But God had plans for Squanto. God delivered a Thanksgiving miracle: an English-speaking Indian living in the exact place where the Pilgrims landed in a strange new world. 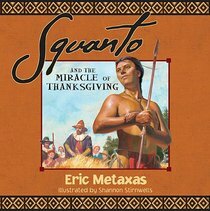 About "Squanto and the Miracle of Thanksgiving"
Eric Metaxas is a truly versatile and prolific writer, whose works have ranged from popular apologetics to meticulously researched biographies, from cutting edge articles in top periodicals to children's storybooks. Whether it's essays, reviews, satire, or even poetry, Eric is a master communicator with the written word. He has even worked on Veggie Tales! His works have been translated into over twenty languages. Eric is extensively involved in broadcasting, hosting his own syndicated radio program The Eric Metaxas Show since 2015, featuring in-depth interviews with high profile guests. He has also appeared on CNN, MSNBC and Fox News as a cultural commentator. He is an in-demand speaker internationally, and has delivered addresses at the White House, West Point, and many universities; he has also moderated public debates involving such high profile - and controversial - figures as Bishop John Spong, Peter Singer; and Bart Ehrman. Eric's New York Times bestseller titles include the acclaimed Bonhoeffer: Pastor, Martyr, Prophet, Spy (2011 ECPA Book of the Year); as well as Miracles; Seven Women; Seven Men; Amazing Grace, and If You Can Keep It: The Forgotten Promise of American Liberty. He has written more than thirty children's books, including the bestsellers Squanto and the Miracle of Thanksgiving and It's Time to Sleep, My Love, illustrated by Nancy Tillman. Eric's writing was first published in Atlantic Monthly, and has appeared in the New York Times, the Washington Post, Regeneration Quarterly, Christianity Today, National Review Online, Beliefnet and First Things. The American Booksellers Association chose Metaxas's The Birthday ABC as a 1995 Pick of the List and Amazon.com honored his Squanto and the Miracle of Thanksgiving with their Number One Bestseller Award for Thanksgiving 1999. Eric is the founder and host of Socrates in the City: Conversations on the Examined Life, a monthly event in New York City featuring entertaining and thought provoking discussions involving such speakers as Sir John Polkinghorne, Dr Armand Nicholi, Os Guinness, Lauren F. Winner and Peter Kreeft. Eric was born in Queens, New York City in 1963 and grew up in Danbury, Connecticut. His father is of Greek descent and his mother of German, and he was raised in a Greek Orthodox environment, though he now attends the evangelical St George's Episcopal Church in New York. He graduated from Yale University, where he edited the humour magazine and won prizes for fiction writing. Eric now lives in Manhattan with his wife Susanne and their daughter.